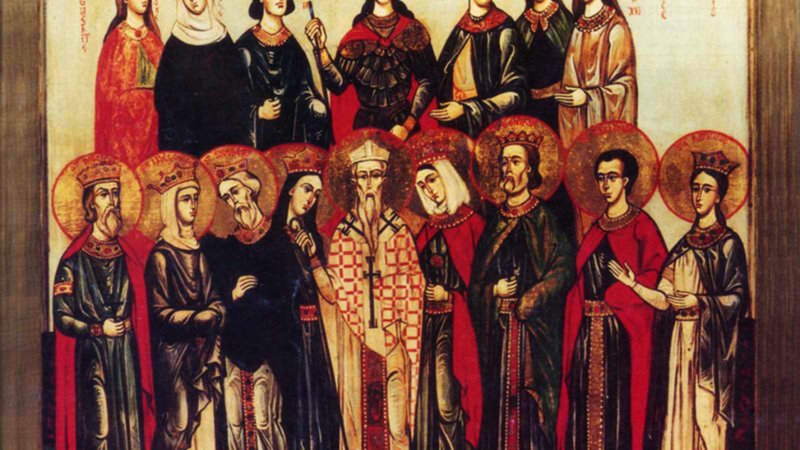 AQUILINUS, GEMINUS, EUGENE, MARCIAN, QUINTUS, THEODOTUS, and TRYPHON, seven Christians martyred (circa 484) in North Africa during the reign of the Arian Huneric, King of the Vandals (r. 477–484). DAFROSA (AFFROSA), wife of St. Flavian (22nd December), and mother of SS. Bibiana (2nd December) and Demetria (21st June ). St. Dafrosa was martyred (circa 362) by beheading in the persecutions during the reign of Julian the Apostate (r. 361–363). FERREOLUS, a sixth century Bishop of Uzès in the present-day Occitanie region of France and brother of St. Tarsica of Rodez (15th January). St. Ferreolus founded a monastery in his diocese, and wrote its Rule. He was also exiled from his See for three years by King Childebert I over political differences. St. Ferreolus reposed in 581. GREGORY of LANGRES, a governor of Autun, who following the death of his wife, was ordained to the priesthood, and later consecrated sixteenth Bishop of Langres. St. Gregory was noted for the kindness and understanding with which he dealt with his flock. He was the great-uncle of St. Gregory of Tours (17th November). St. Gregory reposed in 539, and was succeeded by his son, St. Tetricus (20th March). LIBENTIUS (LIÄWIZO), a monk who ministered to the poor and sick in Bremen prior to being consecrated Archbishop of Hamburg and Bishop of Bremen (one See) in 988. St. Libentius served his See until his repose in 1013. MAVILUS (MAJULUS), martyred in Hadrumetum (present-day Sousse, Tunisia) during the reign of the Roman Emperor Caracalla (r. 198–217) for refusing to worship idols. St. Mavilus was thrown to wild animals to devour. His martyrdom is dated 212. PHARÄILDIS (VAREIDE, VERYLDE, VEERLE), a young maiden in Ghent, St. Pharäildis, who had made a vow of virginity, and subsequently was married against her will. She was abused by her husband for her insistence on keeping her vow and for her late-night visits to church. When St. Pharäildis was widowed, she was still a virgin. One legend says she caused water to spring forth, which healed sick children. St. Pharäildis reposed circa 740, and is one of the patron saints of Ghent. PRISCUS, PRISCILLIAN, and BENEDICTA, three Christians martyred (362) for refusing to renounce their faith during the persecutions under Julian the Apostate (r. 361–363). RIGOBERT, Abbot of L'Abbaye d'Orbais in the Marne region of present-day France, and a celebrated wonderworker, consecrated Archbishop of Rheims in 721. St. Rigobert was later exiled by Charles Martel, and an uncanonical intruder was installed. St. Rigobert was later able to return to his See, but to avoid scandal, St. Rigobert deferred to the intruder and spent the rest of his life as a hermit. St. Rigobert reposed circa 745.